Hi Alison, I love your capsule collection posts but I find myself struggling with the idea in my own closet. I work in a fairly conservative office and though I don't have to wear suits every day, I feel like I have 2 wardrobes – work and weekend. 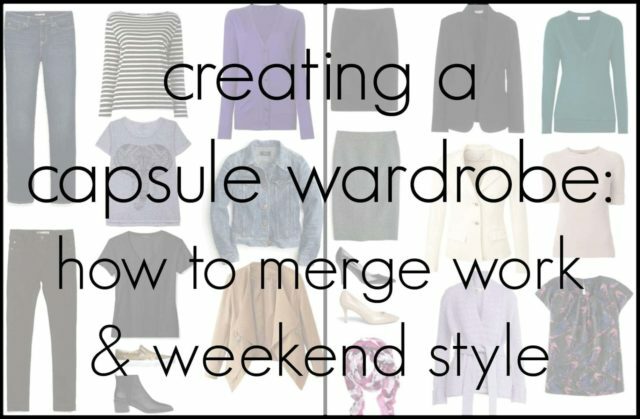 Do you have any advice for those of us that cannot mix workday and weekend wardrobes? At a previous job, I worked in a far more conservative office and had to dress up more. Not necessarily suits every day, but dress pants, nice sweaters and blouses, lots of skirts and dresses. These were pieces that often required dry cleaning and I wanted to keep looking crisp and fresh for a workplace where a professional image mattered. I also traveled on business, and knew these clients would only see me a handful of times in a year so I didn’t have multiple opportunities to prove myself and my style. Back then, I had two wardrobes; one for work and one for play. I didn’t even trot out my work blazers with jeans or pair black work pants with a silky top and heels for a night out. These clothes cost a lot, took more effort to keep looking nice, and I didn’t want to have to replace each season so they were carefully protected outside the 9-5. Sure, magazines and blogs will tell you that you can live with 30 or 50 or 75 pieces and mix and match for day, night, weekend, and beyond. But when you’re trying to buy less, buy quality, and make things last, it’s not always realistic. Unless you feel as though your two wardrobes aren’t properly representing you, I find nothing wrong, in fact I find it smart to have two separate wardrobes. Instead of focusing on mix and match items, focus on a consistent personal style or personality to your wardrobe. If your work wardrobe is primarily black with jewel tones, keep that going in your casual attire. Black pumps for Monday through Friday and black Chelsea boots or ballet flats for Saturday and Sunday. Look for accessories that can work across both wardrobes – a silk scarf that looks great tied at the throat with your silk blouse and trousers on Monday, and worn cowboy style with a Breton tee and jeans on Saturday. A belt in a signature color or print like leopard or snakeskin can pair with your suit and also jazz up a knit dress or pair of jeans and a sweater. 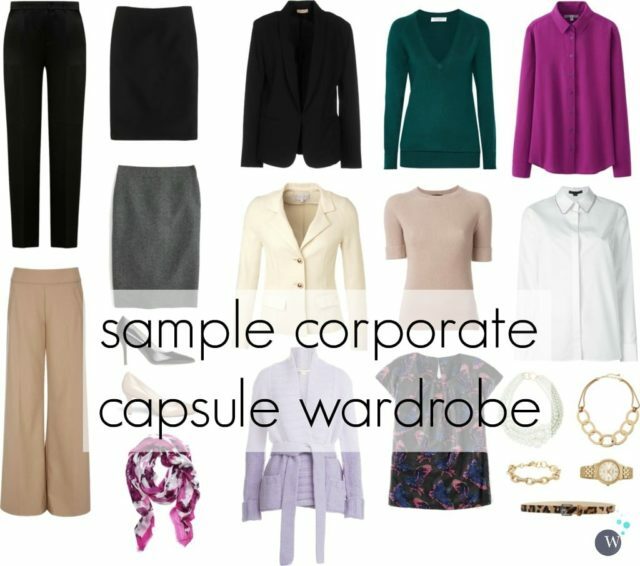 These sample capsule wardrobes show cohesiveness in personal style but are separate pieces. Both have camel and black as their base neutrals, with jewel tones focusing on purples and pinks. In both wardrobes, the printed silk scarf works, the leopard belt works, the jewelry works. It would be easy to transition a few pieces for certain situations – pull in the pencil skirt to wear with the denim jacket for brunch, wear the purple cardigan to the office, slip on the pumps with jeans for happy hour. But most conservative corporate fashion is made of higher quality fabrics and often costs more; it makes sense to elongate its life with fewer wears. Even if this means more pieces in your closet, in the long run it simplifies fashion and you will spend less. 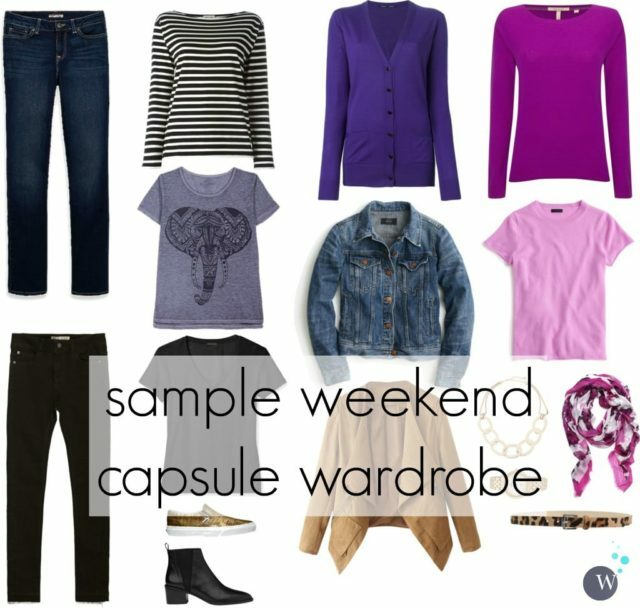 The goal of a capsule wardrobe is to have the most style without excess in your wardrobe. Not everyone will have the same number of things to dress themselves for everyday because not every person has the same everyday. Whether it’s a conservative formal office environment, active social life, passion for gardening, or volunteering for the boys and girls club, you’re going to have pieces in your wardrobe that can’t transition to every aspect of life and just won’t fit into a tidy little capsule. And that’s okay, in fact that’s a good thing because you’re aware of your life, your style, and what is appropriate for each aspect of it. We women are snowflakes, whether it’s our figure, our personal style, or our lifestyle. Wanting to pare down and make more mindful purchases is always a good thing, but don’t get so caught up in the capsule mindset that you end up making your wardrobe less functional. Shop considering need and how it will work with other pieces for that aspect of your life and you will end up with a functional, hardworking closet for your specific self! I love this. Intentional buying and not buying is so important to the capsule wardrobe idea. I definitely have at least two wardrobes. My challenge is making myself put time and money into my weekend/ evening looks. If I’m not careful I can go about looking like a bag lady on the weekends or just really dull/ unfashionable/ wearing the same few things again and again. I agree with everything. I add that when I worked as a lawyer in a fancy firm just few years back, we wore “business casual”–not suits, but nice stuff. I was able to find nice pants ( Talbots was a godsend, but also Lands’ End) that were washable (sometimes even if they said they weren’t–synthetics other than acetate are– and nice skirts likewise. Polyester blouses that are high quality (see, Talbots, Tahari, Nordstrom), look and feel exactly like silk in many cases, or a nice polished sweater or refined tee (in silk jersey–Eileen Fisher), plus a scarf or nice necklace, polished flats….for off duty, I am more polished anyway, but I could and did wear the above –with jeans when really casual. A blazer could be tossed on for meetings. This depends on not having sticky fingered kids at home, and while my German Shepherds could be an issue, the hair tends not to stick to non-woolen items. Your weekend wardrobe is perfect for me everyday. I’m retired, best job ever! And a few looks from your corporate capsule dress me up for theater and dinner. Thanks. The title of your piece had me set to argue, but once I read it I realized we are on the same page. I maintain probably 5 separate wardrobes: conservative office, funky casual, athletic/outdoor gear, ballet gear, and functional stuff. And not much overlap between winter and summer. And it’s okay. I do wish I had a better storage system, but I have very little that isn’t actually used regularly.